Burlesque is a sensual art that appeals to multiple senses. The audience is aurally transfixed by the driving beat of the music, and the dancer’s syncopated rhythm. They are captivated by the tactile and luxurious furs, feathers and fabrics the dancer has created her costume from. When she gently runs her fingers across one fishnet clad gam, the audience can appreciate the sense of the delicate grid of the stocking without ever leaving their vantage point from the bar or laying one finger on the dancer. The dancer as a whirling dervish of hair and glitter and fringe and beading is a visual spectacle unlike any other. But what about scent? Where does that come in to Burlesque Performance? It comes in backstage. It is the light mist of Chanel No 5 in the air. The drops of Egyptian Musk applied at pressure points across the body. 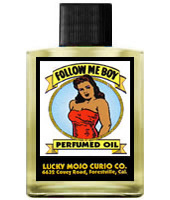 On of my favourite backstage rituals is to put a drop of Follow Me Boy oil on each performer’s palm after the Coochie Crunch to ensure we captivate our audience. The ritual of scent is private and personal, it’s a piece of yourself that you decorate and present to your audience without having to lose yourself or give up more than you can offer till you run on empty. 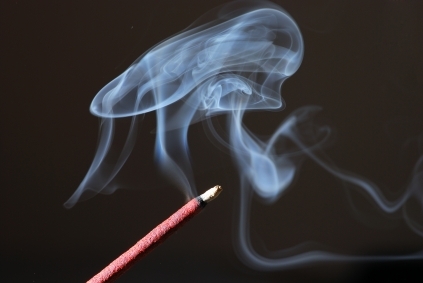 The application of perfume oil, the quiet moment of reflection with burning Nag Champa gives us a moment to gather ourselves before dancing our hearts out on stage, making us better performers. This entry was posted on September 22, 2013 by coochiecrunch in Coochie Crunch Blog and tagged Burlesque Warrior, Dance, Incense, Perfume Oil, Tuesday Laveau.